As you have probably already heard by now, actor James Gandolfini has sadly and suddenly passed away at the age of 51. 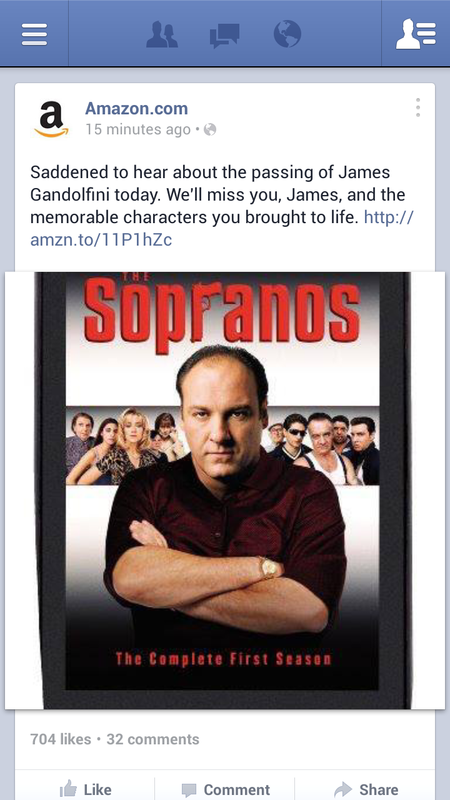 And to add just the right hint of commercialism to this tragic news, Amazon’s Facebook feed was there to remind everyone they can remember the late actor by purchasing DVD collections of The Sopranos. The post seen above was published on Amazon’s Facebook page not long after news of Gandolfini’s passing had begun making the rounds. Had the online giant merely posted the text and the photo, none of Amazon’s 19 million Facebook followers would have noticed, but adding a link to the Season One DVD collection struck more than a few people as crass. The post has since been pulled (not before any number of people, including Consumerist reader Richard, managed to get screen captures), though people are still complaining. We doubt this was a deliberate executive decision by Amazon to cash in on Gandolfini’s death — otherwise it would probably have linked to the Amazon streaming video option instead of the DVD set — and more likely a mistake by some addle-brained kid in the company’s social media group. Regardless, it should be a lesson to other retailers that you should at least give it a few hours before trying to sell people on a newly deceased celebrity’s catalog. The sales bump is going to come anyway; it’s probably best just to let it happen naturally.